Hubert von Goisern takes part in the Folk Days in Bad Ischl, including a seminar at Salzburg University. Hubert von Goisern signs the Lion's Club celebrity lion in Bad Ischl. The Joanneum Research centre study Hubert's heartbeat during a concert and make some interesting findings. 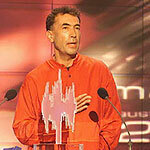 Hubert von Goisern receives an Amadeus Award for his comeback album Fön and causes a stir with his acceptance speech.